“A place for us!” was the delighted response of Cape Town’s invisible street children, the girls, when Ons Plek Intake and Stabilization “Shelter” opened for them in 1988. 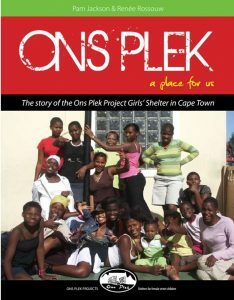 Ons Plek, meaning Our place, is the only residential Child and Youth Care Centre in Cape Town that specialises in developmental and therapeutic intake services for girls who have lived, worked or begged on the streets of Cape Town. The girls’ basic needs of food, clothing, shelter, education and love are provided, with care that aims to be healing for the girl and her family. Once the children have crossed the threshold into Ons Plek they are not here as street children, but as children who are looking for a new place in society. They want to be seen as ordinary children. For them Ons Plek is not a project for female street children, but a place, “OUR PLACE, where ‘sifunda ukuphila’ — we learn for our future lives”. Our Long term Treatment Centre “Siviwe“, meaning ‘God has heard us’, also named by the girls, provides an environment undisturbed by direct contact with street life. Once the girls have weaned themselves from street life while at Ons Plek, and adjusted to a more structured life, they can move to Siviwe in Woodstock. Siviwe is a registered residential Child and Youth Care Centre, and the services dovetail with that of the Ons Plek Intake Centre. Our Early Intervention Centres named “Ukondla“, meaning ‘to nourish’, reache out to the children of Philippi who are at risk of dropping out of school or home and roaming the streets. The Ukondla programmes provide support to help children cope in school and at home. To give or not to give to children on the streets? – What happens when you give directly to a child on the streets? Giving to Ons Plek – funds, time, skills, there are many ways to help….